The mammillary bodies are a pair of small round bodies, located on the undersurface of the brain that, as part of the diencephalon, form part of the limbic system. They are located at the ends of the anterior arches of the fornix. They consist of two groups of nuclei, the medial mammillary nuclei and the lateral mammillary nuclei. 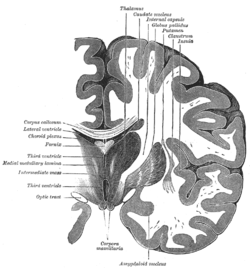 Neuroanatomists have often categorized the mammillary bodies as part of the hypothalamus. They are connected to other parts of the brain (as shown in the schematic, below left), and act as a relay for impulses coming from the amygdalae and hippocampi, via the mamillo-thalamic tract to the thalamus. Mammillary bodies, and their projections to the anterior thalamus via the mammillothalamic tract, are important for recollective memory. The damage of medial mammillary nucleus leads to spatial memory deficit, according to observations in rats with mammillary body lesions. Damage to the mammillary bodies due to thiamine deficiency is implied in pathogenesis of Wernicke-Korsakoff syndrome. Symptoms include impaired memory, also called anterograde amnesia, suggesting that the mammillary bodies may be important for memory. Lesions of the medial dorsal and anterior nuclei of the thalami and lesions of the mammillary bodies are commonly involved in amnesic syndromes in humans. Mammillary body atrophy is present in a number of other conditions, such as colloid cysts in the third ventricle, Alzheimer’s disease, schizophrenia, heart failure, and sleep apnea. In spite of this the exact function of the mammillary bodies is still not clear. ^ "Mammillary Bodies". Springer Reference. Retrieved 2013-06-03. ^ Vann S, Aggleton J (2004). "The mammillary bodies: two memory systems in one?" (PDF). Nat. Rev. Neurosci. 5 (1): 35–44. doi:10.1038/nrn1299. PMID 14708002. .
^ a b c Seralynne D. Vann (2010). "Re-evaluating the role of the mammillary bodies in memory" (PDF). Neuropsychologia. 48 (8): 2316–2327. doi:10.1016/j.neuropsychologia.2009.10.019. PMID 19879886. ^ Duprez T, Serieh B, Raftopoulos C (1 January 2005). "Absence of memory dysfunction after bilateral mammillary body and mammillothalamic tract electrode implantation: preliminary experience in three patients". AJNR. American journal of neuroradiology. 26 (1): 195–7, author reply 197–8. PMID 15661728. Wikimedia Commons has media related to Mammillary bodies. "Anatomy diagram: 13048.000-3". Roche Lexicon - illustrated navigator. Elsevier. Archived from the original on 2014-01-01.